Tattwa networks - Your friendly Computer repair services! Your friendly Computer repair services! Tattwa Networks soon to start services in Sri Lanka! Tattwa Networks will soon be running services in Sri Lanka as well to assist with supplying customers with latest computers and gadgets, website and internet markering services. Increase your business visibility or personal hobby with our seo services for your website or business! Have you ever thought of how other businesses in your category always seem to be in front of you on search engine results? The reason for this is they have applied search engine optimisation services to there website and business, which allows them to get the priority over you. If you search for example; "locksmith Melbourne ", you will see that a list of different businesses will show. For this example every locksmith based on this term. The positioning of these businesses is based on the quality and work put into the website and optimisation to push these to the top. If your website is not optimised for search or displaying a good quality website , you will be positioned lower than other businesses. This is the same for social platforms including Facebook, Google+, twitter, etc..
At Tattwa Networks we offer various seo services and packages to help get you more visible, to get more customers and be positioned higher on search engine results. Do you need a website for your business or personal hobby we are also a website design company? At Tattwa Networks we are also a website design company and we offer website packages for any occasion; Personal hobby, Business or to display any type of information. We can design from fresh or create a WordPress based website in which content can be changed by the customer. WordPress also comes with premade themes which can be changed on the fly by the customer or Tattwa Networks. We also offer services for updating pre-existing websites, optimising websites for speed, fixing website issues, applying search engine guidelines. Website design packages come with 1 year Australian hosting and 2 year domain registration. Contact a website design company for your website needs! Contact Tattwa Networks! 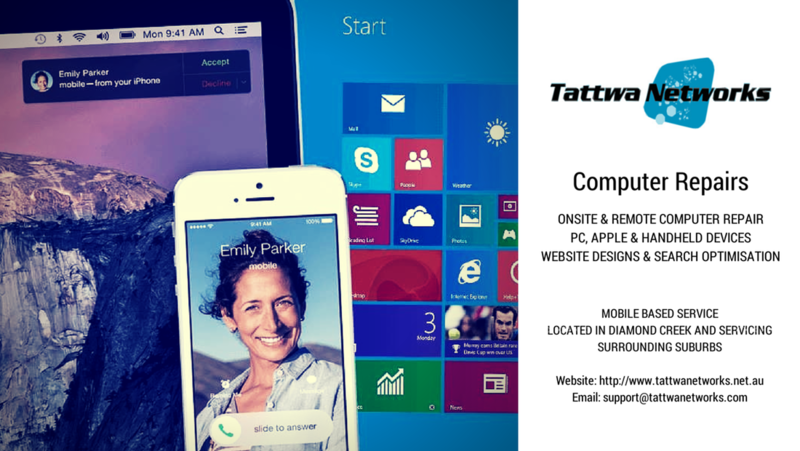 Fixing a problem with remote support, Tattwa Networks offers Remote Computer Repair services anywhere in Australia! If we are struggling with a problem with our PC, Laptop, Tablet, Mobile phone, MAC we don't have to take them into a shop to fix. Depending on the problem, most problems can be solved using remote support. The technician will step you through the process of installing a remote support client in which the computer technician can gain access into the device and fix the problem from afar. One of the most popular remote support clients in Team viewer. Remote support saves the hassle of having to make a trip to the computer shop or calling out an onsite technician. Tattwa Networks offers remote support services which more information can be found through our website. Tattwa Networks offers Remote Computer Repair services anywhere in Australia. If you are in need of remote computer repair services in Australia we can help! From time to time we come across network problems within windows and there causes are numerous. Causes could be anything from Windows system files damaged, Drivers, Hardware, Software related issues, Viruses, Adware or popups, etc..
Or it could be a simple configuration problems the below tips will help in some instances to fix some problems that you might be experiencing. If it a laptop make sure you havent knocked the wireless switch on the laptop which turns the wireless on & off. Make sure you have the right password in your WEP, WPA or WPA2 key. Make sure cables are correctly inserted and that they are not damaged. Make sure you have the correct and compatible drivers installed for the wireless adapter. Make sure you have no missing drivers. Check the Network connection settings to see if they are set correctly. The below commands can be run in Windows and can help to reset the internet and any faulty settings. 2/ Make sure you run CMD prompt as Administrator else these will not work properly..
After this restart your computer. This will reset the winsock , firewall and adapters and take them back to the default settings that Windows originally came with. This doesnt always work there may be a large amount of damage done to the computer and you may need to take it into a technician. Computer Technician / Web Designer and Manager of Tattwa Networks a mobile computer repair service.